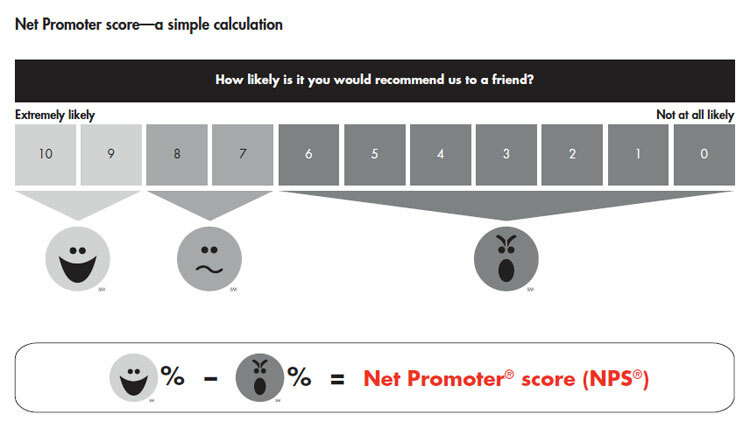 I would be remiss to not include Net Promoter Score (NPS) in my series on ways to segment your customers in order to deliver a better, perhaps more-personalized, customer experience. Unless you've been hiding in a cave for the last few years, I think you know what NPS is. But just in case you've just emerged from hibernation (spring is almost here, after all! 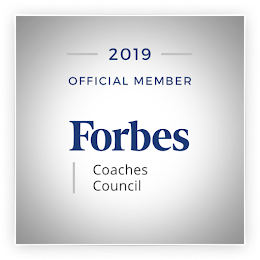 ), NPS, which was first introduced by Fred Reichheld in his article "One Number You Need to Grow" (Harvard Business Review, 2003) is a metric that is derived from one survey question: "How likely are you to recommend Company X to a friend or colleague?" 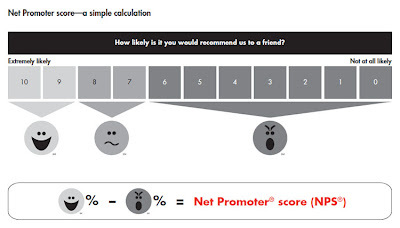 The pure form of NPS dictates that the question is asked with a 0 to 10 scale, where 0 = Not At All Likely and 10 = Extremely Likely, and that the most reliable source is your relationship survey (as opposed to transactional surveys). Respondents to this question are broken down into three segments, based on their ratings, as shown in this graphic from the Bain & Company website. Those who rate their likelihood to recommend a 9 or 10 are considered Promoters, while those who rate their likelihood somewhere in the 0 to 6 range are Detractors. Passives are those who rate their likelihood to recommend as 7 or 8. The actual score comes from taking the % Promoters and subtracting from it the % Detractors. Passives are ignored in the equation. The theory here is that your Promoters speak loudly, but some of that voice will be drowned out by the negative rants of your Detractors - hence, a "net score." It was written about in three books, two by Fred Reichheld and one by Richard Owen and Laura Brooks of Satmetrix, the company that Reichheld partnered with to develop NPS. Promoters will recommend your company/product/services, buy more, engage with you by providing feedback about products and services because they want you to succeed, and continue to do business with you for a long time. Detractors will drown the voice and drain your resources. Your focus is on increasing the % Promoters and decreasing the % Detractors. NPS is a predictor of growth. Cons: NPS is just one number based on just one question in your survey; you must ask more questions to be able to diagnose root causes. In addition, there are a lot of opponents who question the real predictive ability of this metric. Pros: Because it is just one number and an easy-to-explain formula (no black box), it is simple for anyone in the organization to grasp. It rallies the troops to focus on the customer experience. I think the latter is the key here. The reason this segmentation works is that it drives the organization to focus on customers and their experiences; however, that needs to be done in such a way that it is not just about the number, but truly about the customer. That is, don't just work on improving the score; improve the experience, and the numbers will follow. As with any other metric or approach, employ the steps I've outlined in my Key Components of a VOC Initiative to execute properly. It's a journey, not just a number. The key here is to listen, close the loop, make improvements, and communicate - every day. Simple as that! 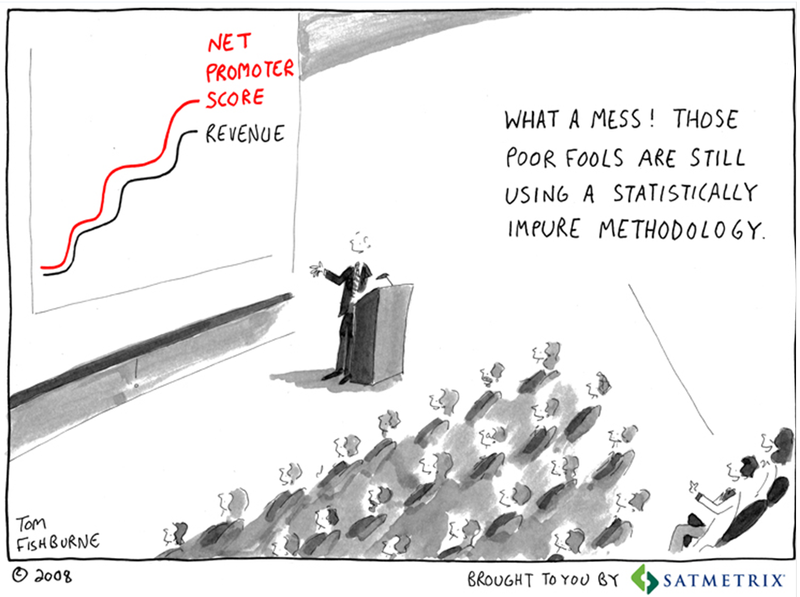 Note that NPS is not appropriate for every company or every industry. I don't advocate one metric over another with my clients. I'll sit and talk through pros and cons and figure out what works best for each individual scenario.